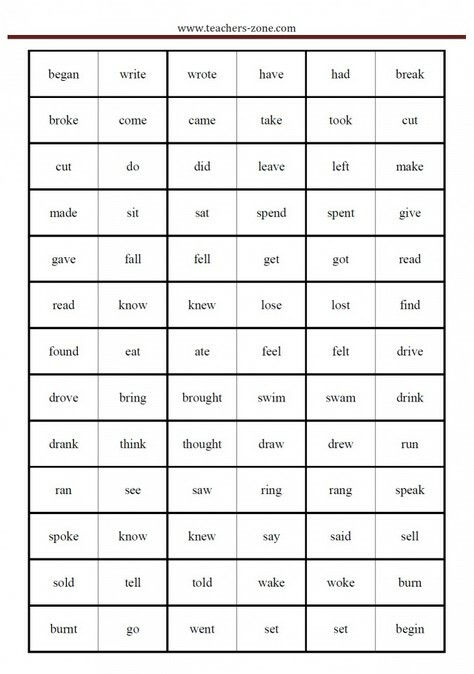 It is a really hard work for your students to learn irregular past tense verbs by heart. How to make it a little bit easier? Domino game can be helpful. 1. Download domino sets, print the page and cut out the cards. 2. Turn domino cards face down on the table and shuffle them. 3. Each player draw 3 cards. 4. The remaining dominoes are used as a draw pile. 5. The first player choose a domino from the draw pile and place it in the middle of the table. 6. Continue to play clockwise. The next player selects the domino from his pile if it matches the domino in the middle of the table. If none of dominoes can be played, the player picks a card from the draw pile. 7. The game ends when the domino sets close the circle. 8. The first who plays his last domino card is the winner. To download regular verbs domino cards click here. Very nice. I use this domino quite often. Have a nice day.